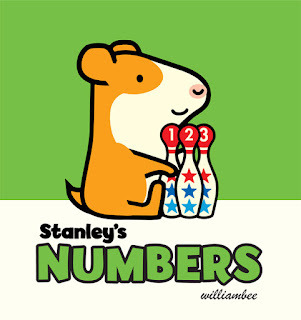 Stanley has new adventures to share in the third and fourth installments of William Bee’s early concepts board book series: Stanley’s Numbers and Stanley’s Opposites. In Stanley’s Numbers, Stanley and Little Woo plan a picnic party! Kids can count with Stanley as he and Little Woo work together by carrying the right amount of snacks, desserts, picnic supplies, party favors, and decorations to prepare for a perfect picnic party. They only need two cakes, but are six balloons enough? Stanley and Little Woo’s counting and hard work pay off when they can sit and celebrate a lively afternoon with friends. 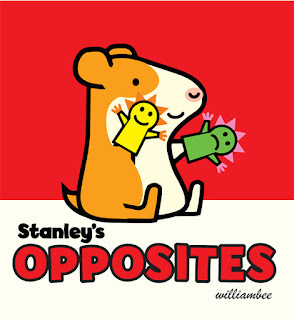 Stanley fans can also learn about opposites in Stanley’s Opposites as they spend an action-packed day with their favorite hamster! Kids begin the day with Stanley as he and Little Woo go on exciting adventures. The two friends learn about opposites as they play with motorcycles, canoes, trampolines, and more, showing the differences between concepts such as light and dark, in and out, and high and low. As the day comes to an end, young readers will recognize Stanley’s bedtime routine. Big news: Stanley has a new fan page! Get the inside scoop on all things Stanley with information on each book in the series and activity sheets to continue the fun, and sign up for the newsletter to keep up with the latest news for the hardest working hamster in the book business. Look for these titles on August 1st at your local library, indie bookstore, or Barnes & Noble.